In modern day living, so often we become overwhelmed with our busy lives and our long ‘To Do’ lists. I have recently been reading The One Thing: The Surprisingly Simple Truth Behind Extraordinary Results by Gary Keller as part of my quest for simplicity in my life and my business. Gary Keller’s remarkable theory is in order to cut through the clutter and the overwhelm in our lives, we simply need to focus and narrow our concentration to “one thing”. We all have the same number of hours in a day so why is it then that some people seem to achieve so much more? What is it about these people that allows them to do more, earn more, achieve more … Keller’s discovery is so simple. “The answer is they make getting to the heart of things the heart of their approach. They go small.” He explains that ‘going small’ is ignoring the multitude of things that you ‘could’ be doing and instead JUST focussing on the one thing that you SHOULD be doing. And when he talks about ‘SHOULD’ be doing – he’s not suggesting that you listen to what others believe you ‘SHOULD’ be doing, but instead, just doing the one thing that is the most important. For me today, the most important thing that I needed to do was to finish the vision board for my book. Last week, what with it being half-term, I felt overwhelmed as if I did not have enough time to work ON my business or IN my business, and the book fell to one side … yet in fact, when I reflect back on last week, I did start writing. (By the way, if you are thinking about writing a book, then I highly recommend the Expert Author programme run by Alison Jones). And now … I need to share that vision board – to hold myself accountable. Are you ready for the unveiling? Drum roll please (and scroll down a little further). My next “most important thing to do” is to put my vision board somewhere that I can see it every single day to remind myself of my goal, my vision and to keep me inspired, motivated and focussed to finish this book by the end of May 2015. What about you? What is the most important thing you need to do today? If you love the idea of being The Confident Mother, sign up here to receive your exclusive workbook. 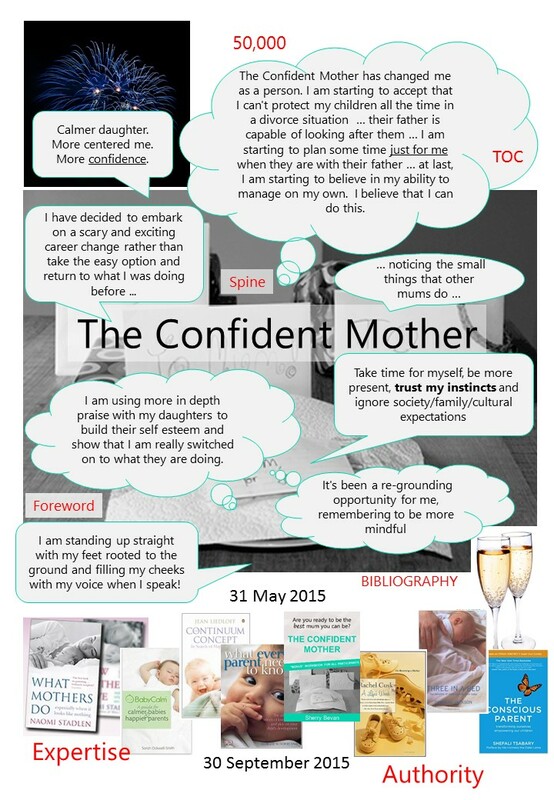 Although the online conference has finished, I continue to interview inspirational mothers on a monthly basis as well as free monthly webinars to help you on your journey to be The Confident Mother. When you sign up, I will also share details of how to purchase the complete library.